(September 26, 2018 - Brandon, MB) --- The 21st annual presentations of the Manitoba 4-H Young Horse Development Project (YHDP) were held September 3, 2018 at the Westoba Agricultural Centre of Excellence, in Brandon, Manitoba. The project provides a venue for senior 4-H members to demonstrate their knowledge gained through the 4-H Equine Program, as well as to showcase the stock being bred and raised on Manitoba's equine ranches. Each year interested senior 4-H members (14 years of age by January 1 of the current year) apply to the YHD Project's Advisory Committee. Upon selection, members are given a list of participating Manitoba Equine Ranching Association (MERA) and Saskatchewan Equine Ranching Association (SERA) ranchers from whom they may purchase a weanling. Prices are pre-set, and ranchers receive half of the purchase price. The balance is placed in that year's Project Enhancement Fund. The YHD Project involves a two-year commitment and teaches 4-H members valuable life skills about taking responsibility, setting goals, and applying the knowledge gained. Members raise and train their horses with the objective of presenting them as a yearling "in hand", and as a two-year-old "under saddle". Members receive payouts through their yearling presentations (1/3 of the Enhancement Fund) and through their two-year-old presentations (the remaining 2/3 of the fund); completing their project books; and by adhering to the rules and regulations. Formal placings for the presentations are irrelevant. Members receive an Enhancement Fund payout based on their individual efforts, so the experience is self-achieving. 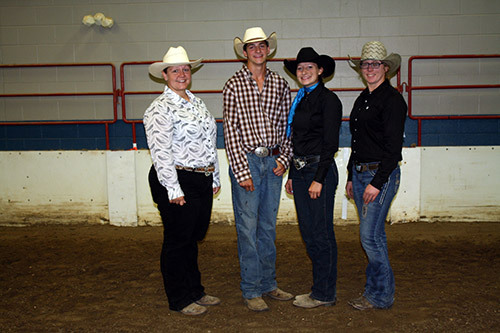 In 2018, four 4-H members exhibited their registered yearling horses "in hand": two Quarter Horses, one Paint and one Appaloosa. Each member was evaluated on the elements of basic showmanship skills, conditioning of the horses, and their abilities to teach their horses to work on a longe line and to load into a trailer. Scores ranged from 209 points to 242 points, out of 260 possible points. The members earned a share of the $583.33 in the 2017 Enhancement Fund. As a group, they accumulated 877 points, averaging 219.25 points each, and will be paid $0.66/point, based on their individual scores. Each member received a copy of their evaluation, a tri-coloured neck banner, and a copy of Horse Industry Handbook - A Guide to Education, Care and Management, published by the American Youth Horse Council sponsored by the North American Equine Ranching Information Council (NAERIC). 4-H member Kirsty Miller, 16, of Forrest, Manitoba is currently in Grade 11 at Elton Collegiate and says, "I have not yet decided on my future education, but it will probably be something in Agriculture." Kirsty was born in Dumfries, Scotland where her parents had a farm. Kirsty says," We came to Canada when I was three-years-old. My Mom has had horses for years; she taught my sister and me to ride. This is my ninth year with a 4-H Equine Project, but the first time I have participated in the Young Horse Development Project. I love the program because it gives kids an opportunity to select and bond with a young horse and become best friends. It's not the same as starting with an older horse." Kirsty purchased her weanling Appaloosa gelding from Bridgeman Land & Livestock Ltd. She says, "I had three other weanlings to choose from, but I chose him because he was so quiet, but curious. I liked his movement, and straight conformation." Kirsty says, "In the future I expect we will do something like cutting or reining with him, as he gets bored easily. I plan to keep him since I have bonded so well with him." Kirk and Gail Bridgeman, who own and operate Bridgeman Land & Livestock Ltd., at Rapid City, Manitoba, have been equine ranchers for 37 years. Gail says, "Our breeding operation consists of approximately 120 mares and 10 stallions, with Quarter Horses making up 75% and Appaloosas making up 25% of our herd. We have been offering weanlings to 4-H members in the YHD Project since the beginning (21 years ago) and some are chosen as project horses every year. We like to see kids raise a foal and we hope they get some knowledge and satisfaction from it. We feel youth are the future of the horse industry and we try to attend these annual events to support the 4-H members as they present their young horses." 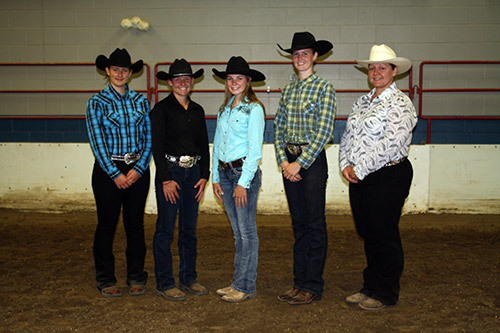 Three 4-H members presented their two-year-old Quarter Horses "under saddle". Each horse and rider were scored based on their individual performance over a predetermined horsemanship pattern. Scores ranged from 203 points to 235 points out of a possible 270 points. The members earned a share of the $1,166.67 remaining in the 2016 Enhancement Fund. As a group, they accumulated 662 points, averaging 220.67 points each, and will be paid $1.76/point based on their individual scores. Each member received a copy of their evaluation, a tri-coloured neck banner, and trophy cooler, sponsored by NAERIC. 4-H member Robyn Yaremchuk,18, of Rossburn, Manitoba, is now in year one of the faculty of Science at the University of Manitoba. Robyn says, "I am working towards either a Science degree or Pharmacology." 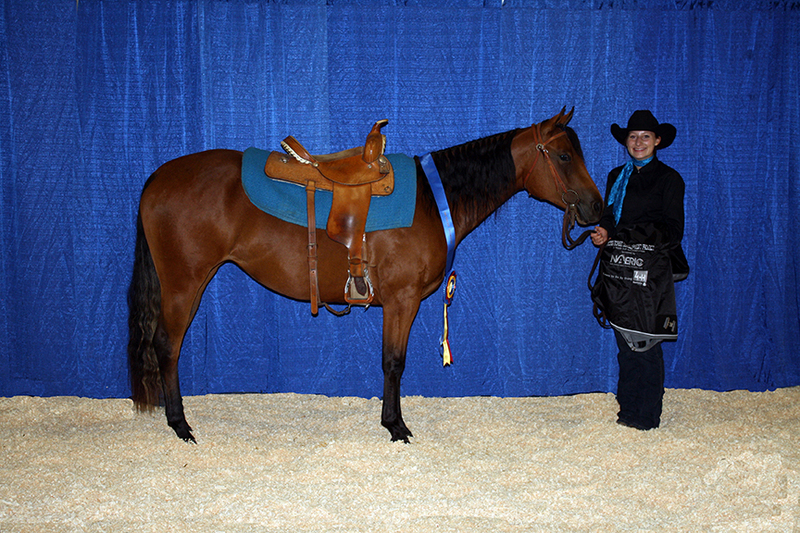 Robyn presented her Quarter Horse mare, Good Hot Treasure as a yearling in the 2017 Young Horse Development Project presentations. She says, "What I like most about her, is that she has a great mind, super calm, and always gives 100% every time." 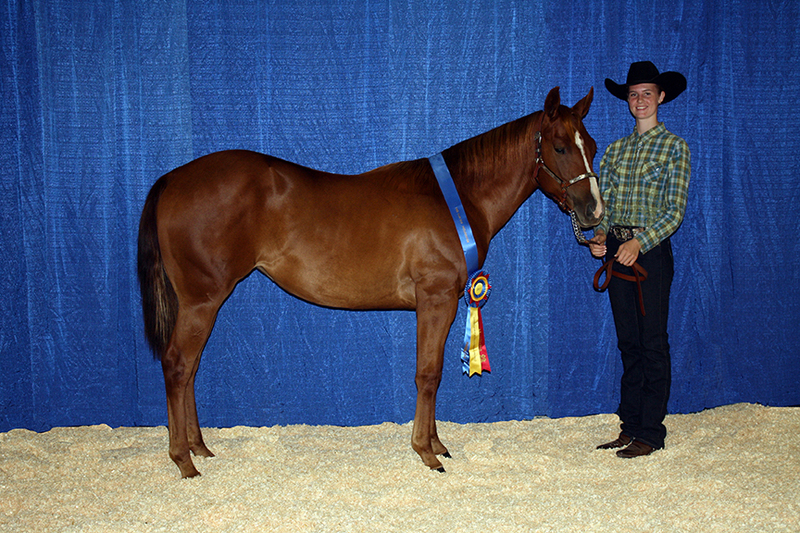 Robyn has been active with horses as a 4-H Equine Project member for nine years. 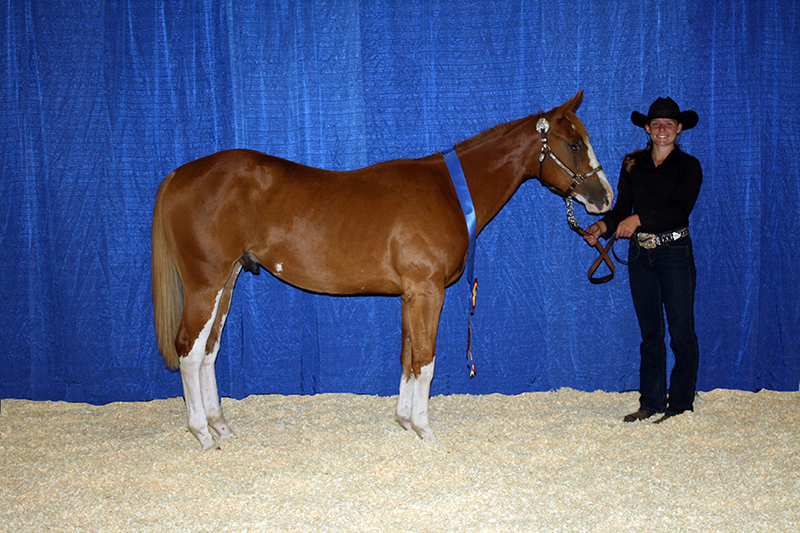 She says, "In my first year, I acquired a green-broke three-year-old gelding for my 4-H Equine Project. He's now eight, and a finished all-around show horse. 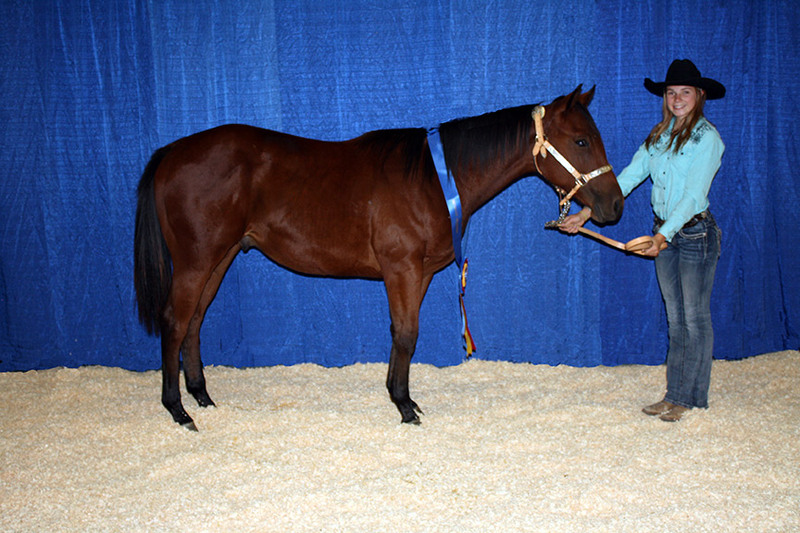 I chose this project filly from Little Valley Quarter Horses because I wanted a bay mare who is a nice mover. 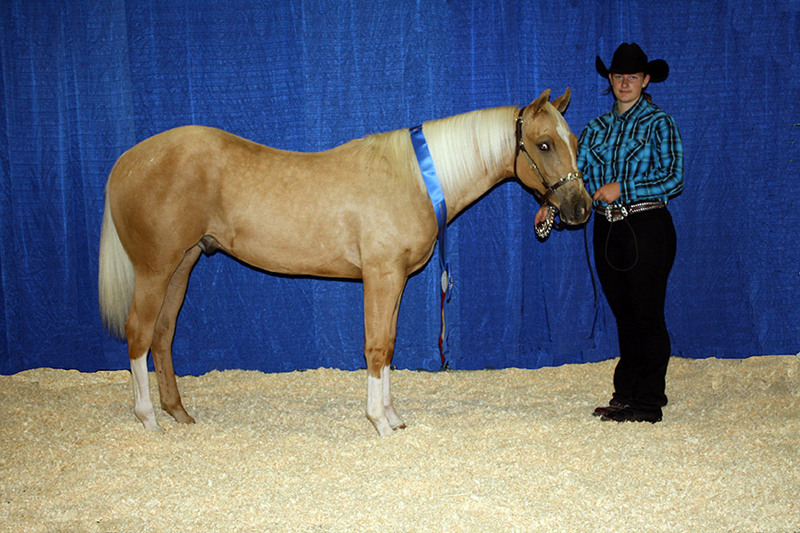 I plan to keep her and finish her as a show horse in Western Pleasure - to move on to Quarter Horse breed shows. What I have learned from this project is that I would definitely recommend it to other 4-H members. It's very beneficial and well worth the time, money and effort." Greg, Faye and Christine Little own and operate Little Valley Quarter Horses at Decker, Manitoba. They have been Equine Ranchers since 1992. Their breeding program is comprised of approximately 100 mares and 10 stallions, 90 percent Quarter Horses and 10 percent Appaloosas and Paints. Faye says, "We have been involved with the 4-H Project since the start in 1998 and have sold many weanlings to members. 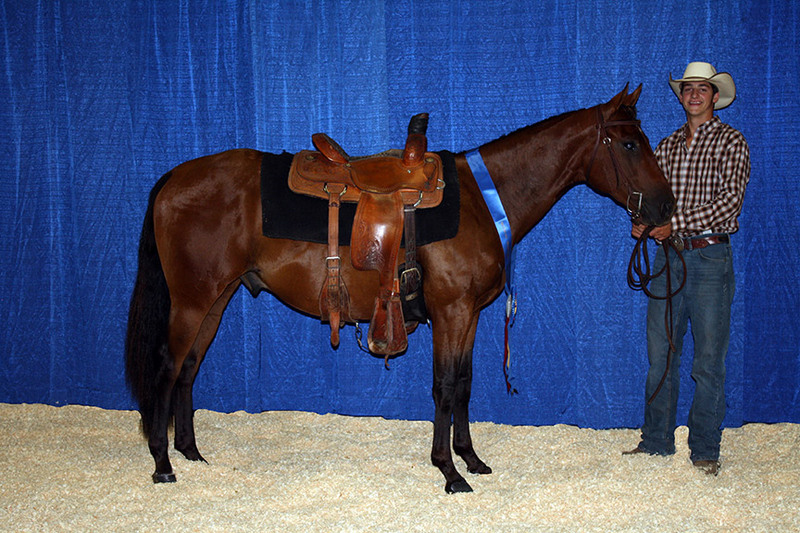 In other years, and again this year, members presented our horses in both the yearling and the two-year-old divisions. It gives us a lot of satisfaction to see all these 4-H members choose weanlings from our breeding program. There were several reasons we decided to participate in this project right from the beginning. We feel it is not only a good way of promoting our breeding program, but also gives the 4-H youth an opportunity to develop their horsemanship skills." The 2018 evaluator of the yearling and two-year-old presentations was Kristi Argue. She says, "I live in Hamiota, Manitoba, with my husband and two horse-crazy girls. I was introduced to horses at the age of four. My family spent the summers hauling our horses to local fairs, which is something I continue to do with my girls. I was in the Manitoba 4-H Program for ten years in Elkhorn and Virden. 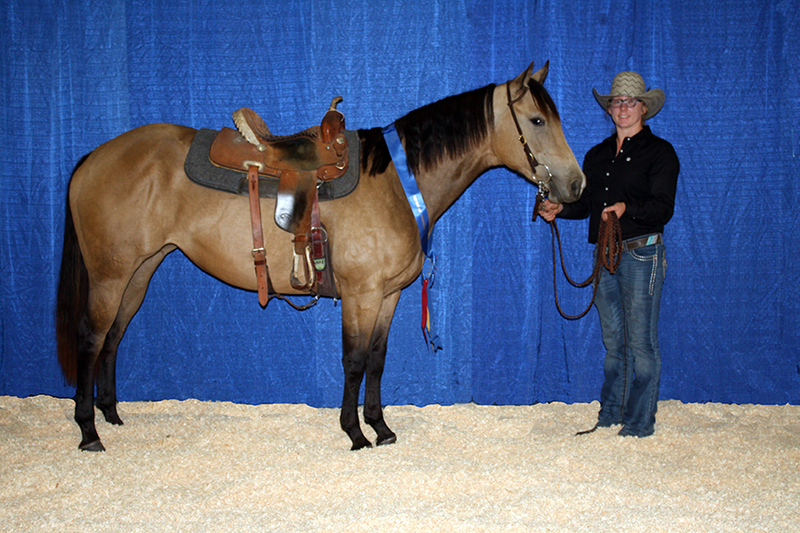 I have been judging and giving riding lessons for the last five years and competed with my first two-year-old in the 2017 Manitoba 50/50 Futurity." "Dawn Krinke, Office Manager, Manitoba 4-H Council Inc., Brandon, Manitoba says, "We had a total of 1953 Manitoba 4-H members in 2017-18 and 346 equine projects were undertaken. The YHD Project's Working Committee manages enrollment in the project, provides the project materials, and directly administers the project. The project provides an opportunity for members to establish relations with Manitoba and Saskatchewan ranchers and to own and develop a young horse. The members gain advanced skills in selecting, feeding and handling horses, and an increased awareness of the equine industry." Lynn Coffey, Chairperson of the YHD Project's Advisory Committee says, "We have a commitment from MERA and SERA ranchers and NAERIC to continue this program through to the 2020 'under saddle' presentations. We are grateful to the Manitoba 4-H Council for sponsoring the fees to cover our project evaluator. We also appreciate the ongoing support of the individual NAERIC-member equine ranchers who offer their weanlings, and NAERIC for sponsoring the costs of awards, facilities - including the arena and stabling, post-event press releases, and colour photographs for the members and ranchers." The YHD Project's Advisory Committee consists of: Lynn Coffey, Ethelbert; Darlene Dudar and Marsha Dudar, Ethelbert.